SFAC Galleries 9th annual DIY art collecting experience is back! Passport 2017 is over. join us next year for our 10th passport Anniversary! To purchase Concierge Passports from this year's event please click on the button below. Concierge Passports are fully stamped passports and are available to purchase for $125 each. Purchase your Concierge Passport Now! Passport 2017 is coming to Middle Polk!! SFAC Galleries unique event Passport puts the art collecting experience in the hands of the general public! 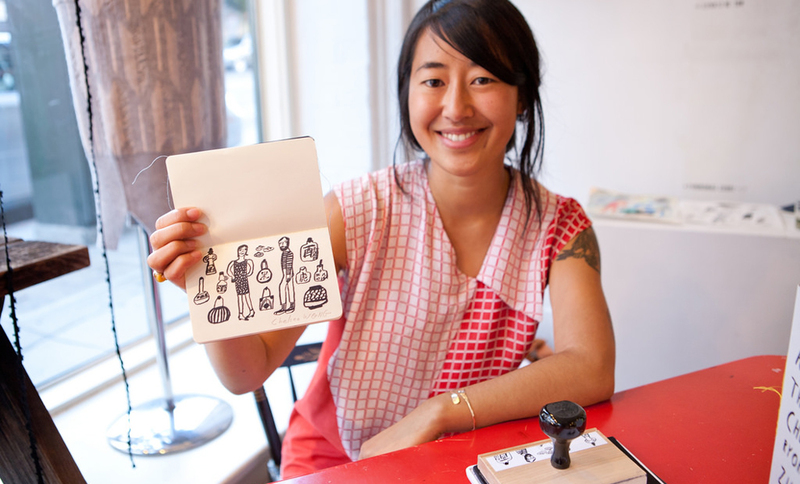 By bringing local artists into small neighborhood businesses, Passport attendees can “create” their own limited-edition artist’s book by collecting original, artist-designed stamps in a customized “passport” notebook. Walking throughout Middle Polk, hundreds of do-it-yourself art collectors will follow a designated route to collect stamps from emerging and established Bay Area artists while discovering the small businesses that line one of the Mayor’s Invest in Neighborhoods corridors. For the ninth year, we invite you to celebrate the Middle Polk neighborhood by supporting local businesses while collecting "passport" stamps from hot local artists in your limited edition customized journal. Sixteen emerging and established artists/collectives: Bonanza, Ajit Chauhan, Kevin B. Chen, Jayde Fish, Nicki Green, Sahar Khoury, Lynn Marie Kirby, Sam Lee, MendeDesign, Mansur Nurullah, Carissa Potter, Miriam Klein Stahl, Suavecita Press, Ben Venom, Leila Weefur and a stamp from the Roy De Forest estate. We are very excited to have such unique and diverse businesses and organizations in Middle Polk participating as host venues this year, including: Belcampo, Belle Cose, Bird School of Music, Bob's Donuts, Bow Wow Meow, The Candy Store, Cheese Plus, Cole Hardware, Common Sage, Frame-O-Rama, Lotta's Bakery, Modern Life Designs, Picnic, ReLove, Russian Hill Bookstore, Sofa Creations, St. Lightning Shop & Studio for the Practical Arts, and Studio Gallery. Step 1: Purchase your passport for $25 here. Passports will also be available for purchase the day of the event at Passport Home Base (Cheese Plus, 2001 Polk St) and at Passport Outpost (Lotta's Bakery, 1720 Polk St.). Only official Passport 2017 notebooks will be eligible to receive stamps. Step 2:Pick up your Passport and event map at Home Base/Will Call (Cheese Plus, 2001 Polk St) between 11:30 a.m. and 2 p.m. on Sunday, October 22 come rain or shine. Don't worry; we'll stamp it for you. Collectors can purchase a Concierge Passport for $125; gallery staff will collect all the stamps and mail it to the purchaser’s home. To purchase, click here or call the SFAC Galleries at 415.252.2240 or email Maysoun Wazwaz at Maysoun.Wazwaz@sfgov.org. All proceeds go to SFAC Gallery’s programming fund supporting artist honoraria and exhibition costs.